Are you looking for a wine adventure? How about a red wine with its origins in France, touted as the healthiest red wine, affordable, and flexible as a food pairing. This wine adventure starts in Uruguay, South America’s 4th leading wine producing country after Argentina, Chile, and Brazil. Uruguay is one of the smallest countries in South America located between Argentina and Brazil with the majority of the wine production concentrated in the Atlantic coastal regions of Canelones, outside the capital city of Montevideo, and Maldonado. 80% of the wines produced in Uruguay are red, and Tannat is the most planted variety. To set the mood, I highly recommend watching the Amazon Prime video, “It Starts with Wine” Episode 1: Uruguay: Wine’s Best-Kept Secret. This month the Wine Pairing Weekend group of bloggers is discovering Uruguayan wines and food pairings. Join our Twitter chat Saturday, February 9th at 11:00 am ET using hashtag #WinePW. Don’t miss my fellow bloggers’ posts at the end of this one for more on Uruguay wine and food. Tannat originated in southwest France and was brought to Uruguay with the Basque settlers around 1870. Basque immigrant Pascal Harriague planted the first Tannat vines, and for over a century the variety in Uruguay was known as Harriague. Studies determined Tannat to have one of the highest polyphenols (antioxidants) of all red wines. (Tannat 4000 mg compared to Merlot and Cabernet Sauvignon with about 1200-1300 mg). If you remember hearing about the French Paradox, polyphenols can positively influence your blood pressure and cholesterol! Tannat is Uruguay’s signature grape varietal. Since the 1980’s, there has been an increased focus on quality in viticulture and winemaking practices. According to the Environmental Sustainability Index, Uruguay comes in third for the most environmentally sustainable country in the world behind Finland and Norway. This means Uruguay has some of the purest vineyard environment in the world. All that said, quality Uruguayan wines are priced at $15-30 a bottle, an outstanding value. Tannat is a thick-skinned grape with high tannins. Uruguayan Tannat is frequently blended with other grape varieties resulting in a softer, smoother, more approachable wine that is more flexible when pairing with food. Disclosure: The wine was provided as a media sample, all opinions are my own. Alto de la Ballena is a small, relatively new winery founded by husband and wife team, Paula Pivel and Alvaro Lorenzo in 1998 and located in the southeast region of Uruguay in Maldonado, 15 kilometers from the Atlantic coast. The climate is moderate with a maritime influence. The eight hectares of vineyards are planted on steep slopes of loose gravelly soil and include Merlot, Tannat, Cabernet Franc, Syrah, and Viognier. The estate saw its first harvest in 2005 and the first released wine in 2007. 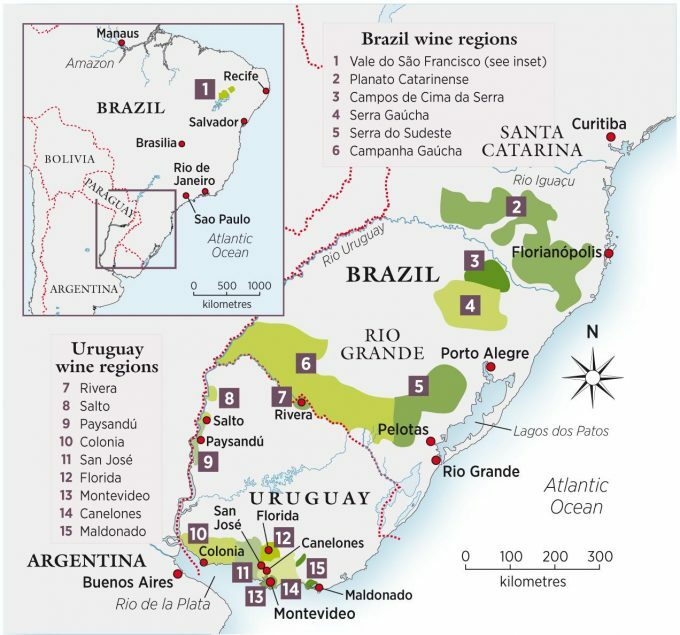 Their wines are currently available in Uruguay, Mexico, Brazil, and Sweden and coming soon to the United States, Belgium, Switzerland, and Argentina. Aging: Skins of the Viognier are added to the Tannat grapes and macerated together at low temperatures for three days. The wine is aged for nine months in American oak barrels. Before bottling, the wine is lightly filtered. Medium ruby in color. Medium bodied and acidity with medium+ tannins. Notes of black currants and vanilla. On the palate a soft mouthfeel with balanced tannins, licorice, and plums. Tannat is known for its high tannins which would call for a food pairing of rich, full flavored, high fat foods to balance the often gripping tannins. 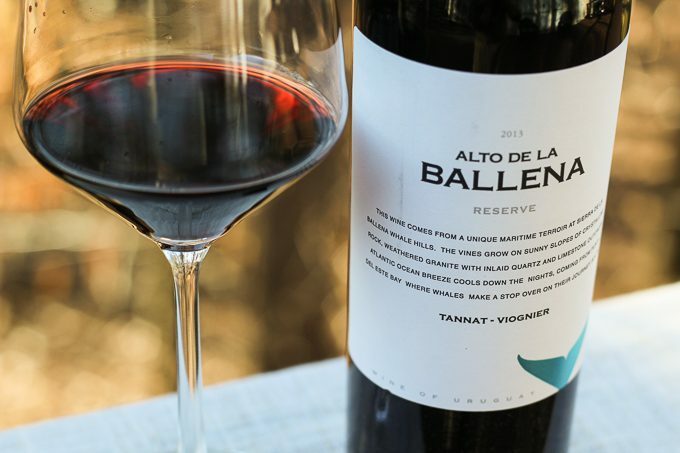 The Alta de la Ballena blended with Viognier, softens those tannins and adds exotic aromatics. 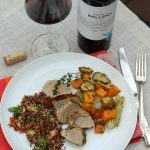 I paired the wine with a winter plate of red quinoa pilaf studded with onions, red bell pepper, potato, cilantro, and a drizzle of aged balsamic vinegar, rosemary and thyme pan-roasted pork tenderloin, and citrus glazed roasted sweet potatoes, fennel, and sunchokes. The overall rustic and depth of flavors paired well with the Tannat-Viognier blend. The roasted vegetables were balanced with the tannin and acidity in the wine. 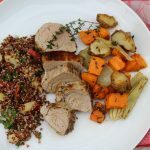 The fennel echoing the licorice notes in the wine, the citrus glaze the hints of aromatics found in the Viognier, and the pork tenderloin with herbs enhancing the earthy flavors of the wine. Overall a clean healthy dinner highlighting winter produce paired with a full bodied balanced red wine. Fill a medium bowl with cold water and add the sunchokes. Scrub them with a vegetable brush. Rinse under running water. Cut them into 1-inch size pieces and dry thoroughly. Peel the sweet potatoes and cut into 1-inch size pieces. Trim the fennel bulbs, quarter them lengthwise, and cut out the core. Slice each quarter in half. Spread the vegetables in a single layer on the lined baking sheet. Drizzle them with olive oil and season with salt, pepper, rosemary, and thyme. Toss to combine and mix. Roast for about 30-40 minutes or until vegetables are tender. Just before serving drizzle the vegetables with 3 tablespoons of the citrus glaze and toss gently to mix. Place all the ingredients in a jar and shake well. 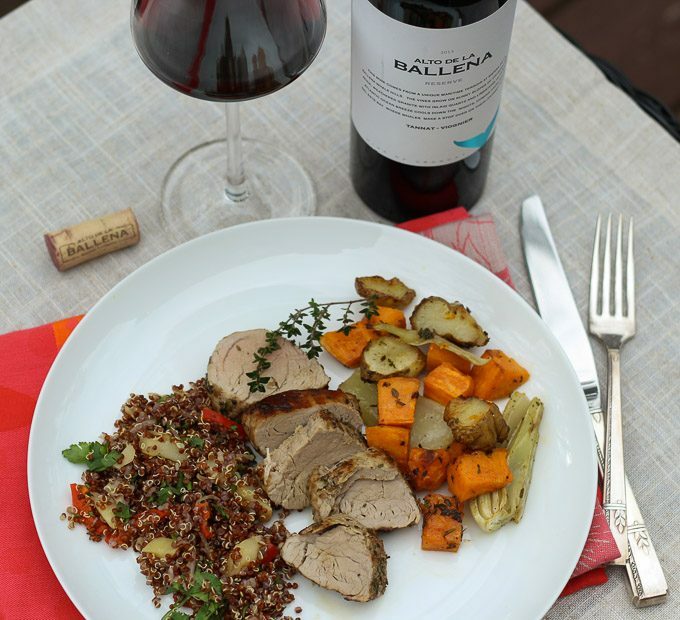 Seasonal roasted winter root vegetables are a nice side to the herb pan-roasted pork tenderloin and paired with a Uruguayan Tannat-Viognier. Cut the tenderloin in half to make it easier to handle when pan searing. In a small bowl, mix together the rosemary, thyme, 1-1/2 tablespoon olive oil, and about 1 teaspoon of black pepper. Spread the mixture over the pork tenderloin, coating it well. In a heavy oven proof sauté pan, add the remaining 1 tablespoon of olive oil and heat over medium high heat. Add the pork tenderloin pieces and sauté for about 6 minutes total turning the meat every 2 minutes until well browned all over. Transfer the pork in the pan to the oven and roast uncovered for about 20 minutes. An instant thermometer should read 145º F for the meat to be done. Cover the meat loosely with foil for about 10 minutes before slicing. Thanks for calling out the Amazon video on Uruguayan wine. The wines definitely need more notoriety. The quality-value score for these wines is hard to top! After watching the Amazon video I was ready to hop a plane to Uruguay! Yes the value of the Uruguayan wines is incredible. I didn’t know tannat had so many polyphenols. I guess that means I should definitely drink more of it. Love the use of sunchokes and red quinoa too. Looks delish! I did not realize the high polyphenols in Tannat until I did the research. Cheers to healthy red wines! Ok,,,,you are the 4th member of this group, thus far, to have recommended this series. I can’t wait to have a free evening to curl up with a glass of wine and the remote. Thanks for sharing a healthier pairing. Yes watch the video, I loved it! Always looking for healthier food and wine pairings. Sounds like a delightful winter pairing, Jane! It was a delicious pairing and on the lighter side. Your winter plate and a Tannat sounds great together! Love the Tannat facts too! Well done Jane! great looking plate to go with the Tannat! Curious how it tastes with the Viogner blended in, a bit lighter perhaps. The Viognier mellowed the tannins of the Tannat and added nice aromatics. Good looking dinner and I’ll bet it was great with the Tannat. I especially liked your quinoa pilaf. 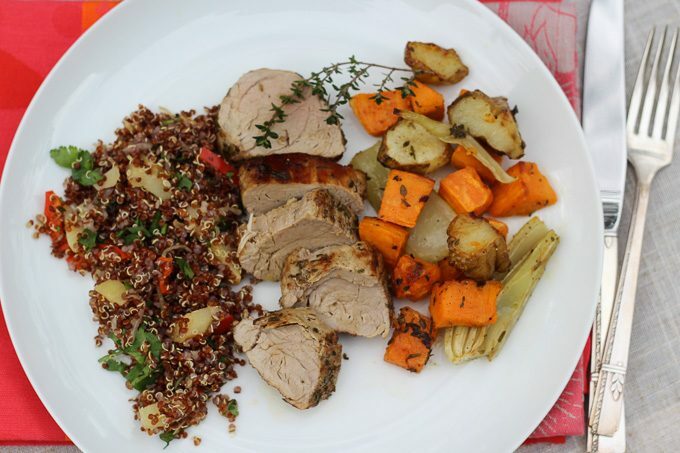 We’ve been exploring ancient grains this year and quinoa has become a favorite of mine. Isn’t it a pleasure to tell the story of a small winemaking family? Your roasted veggies and quinoa have my mouth watering. Lovely paring with the Tannat and how interesting there is some Viognier blended in too. Cheers! I wish you could see the Alta de Ballena property. It has all this rich biodiversity and it’s up on a windy hill. So beautiful!